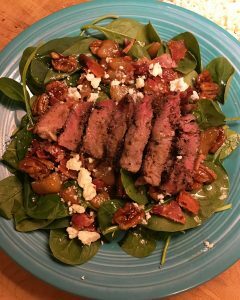 I started searching for salad recipes a while back, but struggled to find many featuring beef *a rancher’s first criteria* that would also be filling. Eventually, I just took bits and pieces from several recipes to make this hearty salad with a mustard vinaigrette. I’ll admit, the combination of ingredients sounds a bit odd, but the sweet and salty flavors compliment each other well and I think that’s what makes it work. Plus, it’s Rancher and Little Rancher approved, which equals a win for Mama! d) When I’m browsing recipes I scroll right past those gorgeous pictures to the actual recipe. We’re hungry people, give us food! Season steak with salt and pepper on both sides, set aside. Peel and chop the pears, set aside. Grate parmesan, set it aside too. set.everything.aside. Then go light your grill. Heat a 12-inch skillet and cook the bacon to your preferred level of crispness. Remove it from the pan and place on a paper towel to cool. Do not drain the bacon grease from the pan, you want that goodness for this next step. Over LOW heat, add butter to the skillet and once melted, add the brown sugar. Stir until the sugar dissolves. Add the pears and stir until coated. While the pears are on LOW, throw your steak on the grill over high heat. Just a few minutes on each side should do it. Turn your grill off and take your steak back inside before you burn something, like the pears. Stir the pears. Now that your watchful eyes are back inside, turn the heat up to MEDIUM, stirring occasionally until they are a gorgeous golden brown. Add the pecan halves, stirring to coat until toasty. *Man, that’s a lot of stirring…eye on the prize* Remove from heat. Combine ingredients for the vinaigrette. Shake or stir until mixed. You’re ready to plate your salad! 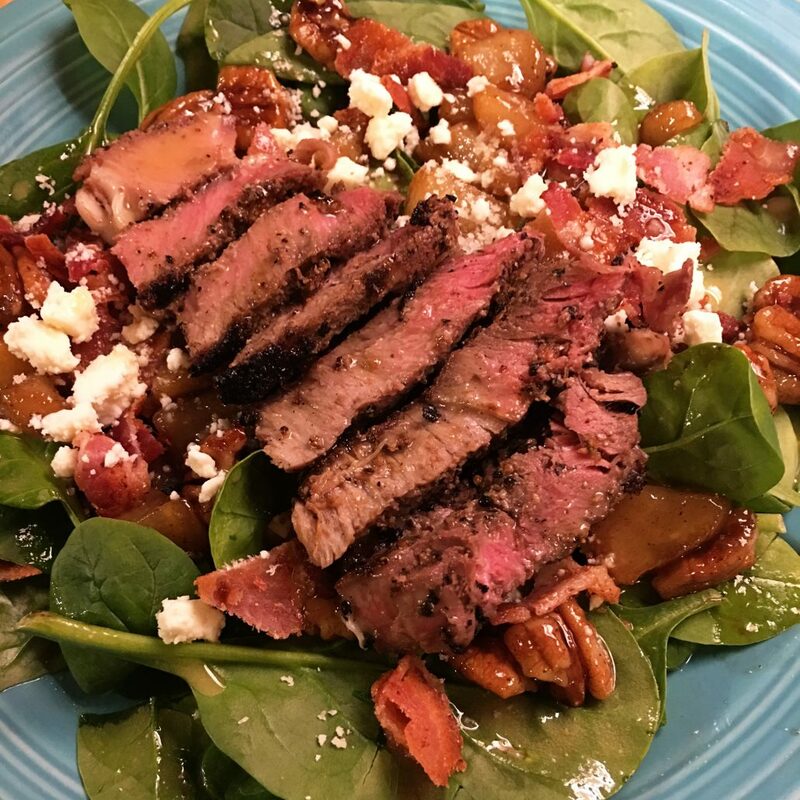 Pile spinach on your plate, layer with pears and pecans, crumble a few strips of bacon on top, sprinkle with feta and parmesan, top it off with steak, and drizzle with dressing. Testing out the comment notification email delivery. This does look very delicious though!